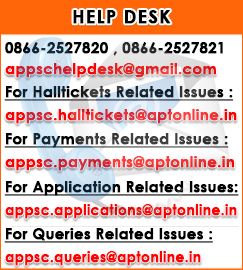 APPSC Official Website psc.ap.gov.in APPSC Jobs Notifications psc.ap.gov.in Latest updates Official Website | Jobs Notifications, Results, Online Applications, Hall Tickets, Merit Lists, Selection Lists, web options, appointment orders Updates on Latest Recruitment Notifications, Syllabus, Mock Tests, View Response Sheet, Jobs Calendar, Selections, Results, Tender Notices, Apply Online Direct Links, Hall Tickets, Results, Merit list, Selection List, web options, allotment orders, appointment orders. Andhra Pradesh State Public Service Commission ( APPSC ) Official Website psc.ap.gov.in to provide the information about APPSC conducting authority activities of Telangana stste and also gives the latest updates on all the Government Job Notifications, Openings, Recruitments, Group-I, Group-II, Group-III, Group-IV recruitments, Departmental Tests, TRT-DSC Teacher jobs, Gurukulam Jobs (APSWREIS, APSTWREIS) VRO, ASO, JL, DL, Principal Direct Recruitments, Applications, vacancies Details, Hall Tickets/Admit cards, Results, Merit lists, Selection Lists, Certificates verification dates, counselling schedule, appointment orders, APPSC Udyoga samacharam...etc..available. The A.P. Public Service Commission came into existence on 1 st November, 1956 with the formation of the State of Andhra Pradesh . Before this, there was Andhra Public Service Commission in the Andhra State and Hyderabad Public Service Commission in the Hyderabad State . Andhra Service Commission came into existence only in 1953 after the bifurcation of composite Madras State into Andhra and Madras States . On the eve of formation of Andhra Pradesh Public Service Commission, Andhra Public Service Commission was functioning with a Chairman and two Members and Hyderabad Public Service Commission was functioning with one Member. Hence, A.P. Public Service Commission was constituted with a Chairman and 3 Members. With increasing work load, Government enhanced the strength of the Commission to Chairman and 5 Members in the year 1981 and later to Chairman and 7 Members in the year 1983. Government again reviewed the strength in 1994 and enhanced it to Chairman and 9 Members. This is the present strength also. The Public Service Commissions had been established under Article 315 of the Constitution of India. The functions of the Commission are enumerated in the Article 320 of the constitution. 1. Conduct of Departmental Tests for several departments. 2. Conduct of examination for admission to RIMC, Dehradun. 3. Conduct of Half yearly examination for IAS and IPS Officers and Proficiency tests for AIS Officers. 5. Consultation in cases of appointment of contract extending over 5 years (Regulation 16). In the year 1963 Government of Andhra Pradesh brought out regulations called “Andhra Pradesh Public Service Commission Regulations” vide G.O.Ms.No.489, G.A.D., dt: 23.4.1963. These Regulations were based on the Madras Public Service Commissions Regulations 1950, adhoc regulations issued for the year 1954, 1956 & 1957 by the Andhra Government and the Hyderabad Public Service Commission Regulations 1952. Transparency in the Functioning of A.P.P.S.C. In 2006 APPSC decided to review the scheme of examination for Group-I and Group-II services. An immediate provocation for this was the unrest in the minds of the candidates about different optionals. Candidates felt that selection of optionals gave unfair advantage because of difference in standards of paper for different optionals. Earlier the Commission had examined the issue of scaling, so as to equate the different optionals so that candidates of equal ability will receive equal final marks regardless of difficulty of test. At that time Commission had arrived at the conclusion that scaling though desirable is difficult to apply in practice. As a part of the review process Commission addressed more than 100 experts in the State outlining the issues in work and requesting the experts for their feed back. The response to the letter of APPSC was more than 50%. All experts agreed that the existing scheme of examination needs to be reviewed. However, the proposed solutions were different. In view of this APPSC decided to conduct a seminar of these experts at Hyderabad in 2006. Most of the experts argued for compulsory papers only without any optionals. They felt that optionals only test the domain knowledge, which is not relevant to the administrative jobs and that it is better to test candidates with reference to subject which are relevant to the jobs. They further suggested development of syllabi for the compulsory papers can be entrusted to an expert committee. They identified the following skills for an effective administrator. i) Problem analysis and suggestion of solutions. ii) Knowledge of society and the economy. iii) Awareness of technology and its potentiality. iv) Quantitative skills and mental ability. v) Knowledge of Constitution, Law and Public Administration. The Commission discussed the recommendations of the seminar and after prolonged deliberations decided to recommend to the Government scheme of examination for Group-I and Group-II services consisting of compulsory papers only without any optional papers. The Commission addressed the Government accordingly. A series of meetings were held at the level of Chief Secretary. After detailed discussions the Government approved the scheme of examination as proposed by the Commission and directed the Commission to evolve the syllabus for the compulsory papers. Commission entrusted the evaluation of syllabus to different subject experts. Several meetings were held to fine tune the syllabi and to define its content. The new syllabi is given in the Annexure for Group-I and Group-II Services Notifications. In addition to the competitive examinations for direct recruitment for various posts, Departmental tests are conducting at 13 District Head Quarters twice in a year in conventional method for the employees of A.P State Government which are prescribed to them to be passed during the probation or for promotion to the next higher category. For conducting Departmental Examinations the Commission have to send bulk Answer Sheet Booklets through transport system for which lot of expenditure is incurred and have to bring back the answer scripts to Commission for valuation. In the year 2011 the Commission have introduced objective type method in Departmental Tests with OMR sheets as answer sheets. By this process lot of expenditure has been reduced and the transport of the OMR sheets to the Commission’s Office for valuation is became easy. 1.Conduct of Departmental Tests for several departments. 2.Conduct of examination for admission to RIMC, Dehradun. 3.Conduct of Half yearly examination for IAS and IPS Officers and proficiency tests for AIS Officers. 4.Watching of temporary appointments exceeding 3 months and according concurrence for their continuance (regulation 16).